The coolest part about it is the fact that it’s a tool: anyone can use it to create something original and brand new. The first thing you’ll need for this project is a designated drawing space. We’ll use the HTML5 canvas element and give it a width and a height of 600px (you can set the dimensions to anything else if you like). Create 3 files: index.html, styles.css, main.js. Don’t forget to include your JS and CSS files in your HTML. This tutorial will be accompanied by four CodePens, one at the end of each section. In my own app I originally used mouse events, and only added touch events when I realized mobile device support was (A) possible, and (B) going to make my app way more accessible. For the sake of code simplicity, I decided that in this tutorial app I will only use one event type, so I picked a third option: pointer events. These are supported by some desktop browsers and some mobile browsers. An up-to-date version of Chrome is probably your best bet. The variables canvas and context let us manipulate the canvas. w is the canvas width and h is the canvas height. The four coordinates are used for tracking the current and previous location of the pointer. A short line is drawn between (prevX, prevY) and (currX, currY) repeatedly many times while we move the pointer upon the canvas. For your drawing to appear, three conditions must be met: the pointer (be it a finger, a trackpad or a mouse) must be down, it must be moving and the movement has to be on the canvas. If these three conditions are met, the boolean draw is set to true. Responsible for canvas set up, this listens to pointer events and the location of their coordinates and sets everything in motion by calling other functions, which in turn handle touch and movement events. This is called to action by handlePointerMove() and draws the pointer path. It only runs if draw = true. It uses canvas methods you can read about in the canvas API documentation. You can also learn to use the canvas element in this tutorial. lineWidth and linecap set the properties of our paint brush, or digital pen, but pay attention to beginPath and closePath. Between those two is where the magic happens: moveTo and lineTo take canvas coordinates as arguments and draw from (a,b) to (c,d), which is to say from (prevX,prevY) to (currX,currY). This is used by init when the pointer is not down (onpointerup) or is out of bounds (onpointerout). This tracks the pointer’s location and stores its coordinates. Also, you need to know that in computer graphics the origin of the coordinate space (0,0) is at the top left corner, and all elements are positioned relative to it. When we use canvas we are dealing with two coordinate spaces: the browser window and the canvas itself. This function converts between the two: it subtracts the canvas offsetLeft and offsetTop so we can later treat the canvas as the only coordinate space. If you are confused, read more about it. This is set by init to run when the pointer moves. It checks if draw = true. If so, it calls recordPointerLocation to get the path and drawLine to draw it. This is set by init to run when the pointer is down (finger is on touchscreen or mouse it clicked). If it is, calls recordPointerLocation to get the path and sets draw to true. That’s because we only want movement events from handlePointerMove to cause drawing if the pointer is down. Finally, we have a working drawing app. But that’s just the beginning! See the Pen Mandala Maker Tutorial: Part 1 by Hagar Shilo (@hagarsh) on CodePen. Now we’ll update our HTML file, adding a menu div with an input of the type and class color and a button of the class clear. This is our new color picker function. It targets the input element by its class and gets its value. Up until now, the app used a default color (black) for the paint brush/digital pen. If we want to change the color we need to use the canvas property strokeStyle. We’ll update drawLine by adding strokeStyle to it and setting it to the input value by calling getColor. This is our new Clear function. It responds to a button click and displays a dialog asking the user if she really wants to delete the drawing. The method clearRect takes four arguments. The first two (0,0) mark the origin, which is actually the top left corner of the canvas. The other two (w,h) mark the full width and height of the canvas. This means the entire canvas will be erased, from the top left corner to the bottom right corner. If we were to give clearRect a slightly different set of arguments, say (0,0,w/2,h), the result would be different. In this case, only the left side of the canvas would clear up. See the Pen Mandala Maker Tutorial: Part 2 by Hagar Shilo (@hagarsh) on CodePen. It’s time to make a line appear where no pointer has gone before. A ghost line! For that we are going to need four new coordinates: a', b', c' and d' (marked in the code as a_, b_, c_ and d_). In order for us to be able to add the first reflection, first we must decide if it’s going to go over the y-axis or the x-axis. Since this is an arbitrary decision, it doesn’t matter which one we choose. Let’s go with the x-axis. Here is a sketch to help you grasp the mathematics of reflecting a point across the x-axis. The coordinate space in my sketch is different from my explanation earlier about the way the coordinate space works in computer graphics (more about that in a bit!). Now, look at A. It shows a point drawn where the pointer hits, and B shows the additional point we want to appear: a reflection of the point across the x-axis. This is our goal. A sketch illustrating the mathematics of reflecting a point. What happens to the x coordinates? The variables a/a' and c/c' correspond to prevX and currX respectively, so we can call them “the x coordinates”. We are reflecting across x, so their values remain the same, and therefore a' = a and c' = c.
What happens to the y coordinates? What about b' and d'? Those are the ones that have to change, but in what way? Thanks to the slightly misleading sketch I showed you just now (of A and B), you probably think that the y coordinates b' and d' should get the negative values of b and d respectively, but nope. This is computer graphics, remember? The origin is at the top left corner and not at the canvas center, and therefore we get the following values: b = h - b, d' = h - d, where h is the canvas height. This is the new code for the app’s variables and the two lines: the one that fills the pointer’s path and the one mirroring it across the x-axis. In case this was too abstract for you, let’s look at some actual numbers to see how this works. 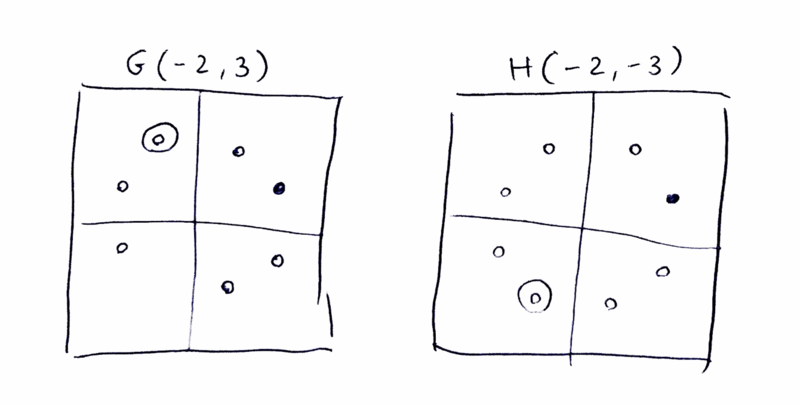 Let’s say we have a tiny canvas of w = h = 10. Now let a = 3, b = 2, c = 4 and d = 3. So b' = 10 - 2 = 8 and d' = 10 - 3 = 7. We use the top and the left as references. For the y coordinates this means we count from the top, and 8 from the top is also 2 from the bottom. Similarly, 7 from the top is 3 from the bottom of the canvas. That’s it, really. This is how the single point, and a line (not necessarily a straight one, by the way) is made up of many, many small segments that are similar to point in behavior. If you are still confused, I don’t blame you. Here is the result. Draw something and see what happens. See the Pen Mandala Maker Tutorial: Part 3 by Hagar Shilo (@hagarsh) on CodePen. I have made yet another confusing sketch, with points C and D, so you understand what we’re trying to do. Later on we’ll look at points E, F, G and H as well. The circled point is the one we’re adding at each particular step. The circled point at C has the coordinates (-3,2) and the circled point at D has the coordinates (-3,-2). Once again, keep in mind that the origin in the sketches is not the same as the origin of the canvas. 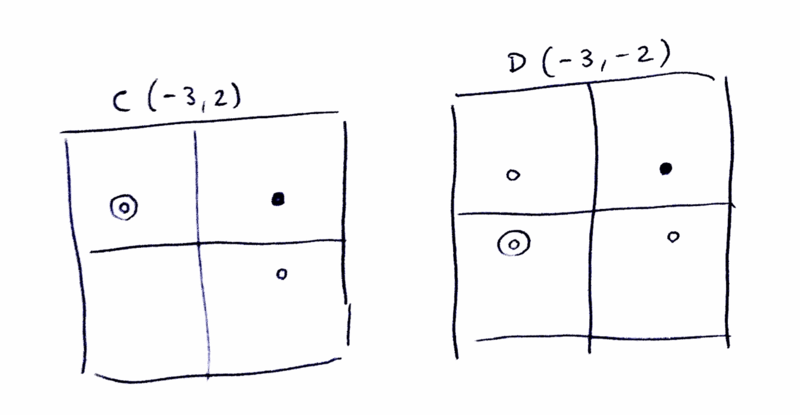 A sketch illustrating points C and D.
This is the part where the math gets a bit mathier, as our drawLine function evolves further. We’ll keep using the four new coordinates: a', b', c' and d', and reassign their values for each new location/line. Let’s add two more lines in two new locations on the canvas. Their locations relative to the first two lines are exactly what you see in the sketch above, though the calculation required is different (because of the origin points being different). You might be wondering why we use w and h as separate variables, even though we know they have the same value. Why complicate the code this way for no apparent reason? That’s because we want the symmetry to hold for a rectangular canvas as well, and this way it will. Also, you may have noticed that the values of a' and c' are not reassigned when the fourth line is created. Why write their value assignments twice? It’s for readability, documentation and communication. Maintaining the quadruple structure in the code is meant to help you remember that all the while we are dealing with two y coordinates (current and previous) and two x coordinates (current and previous). As you recall, our x coordinates are a (prevX) and c (currX). For the fourth line, the same thing happens to our x coordinates a and c.
As you recall, our y coordinates are b (prevY) and d (currY). For the third line we are adding, b' = b and d' = d, which means the y coordinates are the ones not changing this time, making this is a reflection across the y-axis. For the fourth line, b' = h - b and d' = h - d, which we’ve seen before: that’s a reflection across the x-axis. We can leave it out of the next code snippets and just focus on the calculations, i.e, the reassignments. Once again, we need some concrete examples to see where we’re going, so here’s another sketch! The circled point E has the coordinates (2,3) and the circled point F has the coordinates (2,-3). The ability to draw at A but also make the drawing appear at E and F (in addition to B, C and D that we already dealt with) is the functionality we are about to add to out code. A sketch illustrating points E and F.
Their x coordinates are identical and their y coordinates are reversed to one another. This one will be out final sketch. The circled point G has the coordinates (-2,3) and the circled point H has the coordinates (-2,-3). A sketch illustrating points G and H.
Once again, the x coordinates of these two points are the same, while the y coordinates are different. And once again I won’t go into the full details, since this has been a long enough journey as it is, and I think we’ve covered all the important principles. But feel free to play around with the code and change it. I really recommend commenting out the code for some of the points to see what your drawing looks like without them. 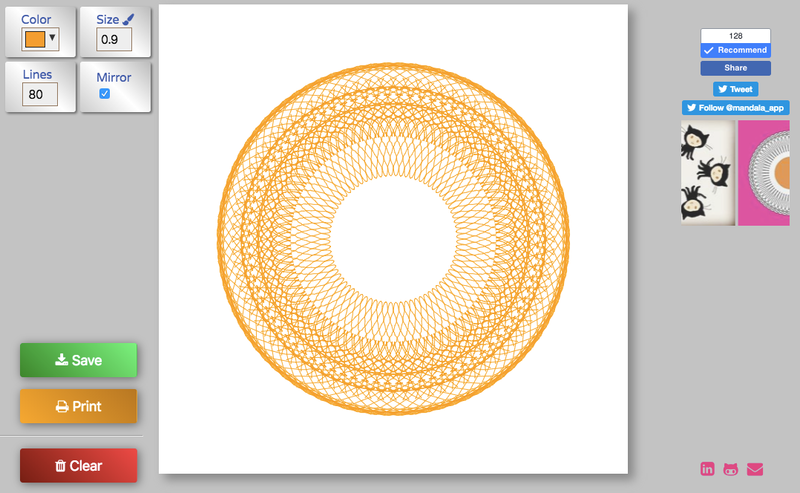 See the Pen Mandala Maker Tutorial: Part 4 by Hagar Shilo (@hagarsh) on CodePen. Hagar is a front-end developer and blogger. After nearly a decade in the publishing industry, she transitioned into software development, and today, part of her mission is to help other women who are on this path. She blogs about the tech industry and career switching, and co-admins a Facebook group for women who are taking their first steps into the industry. 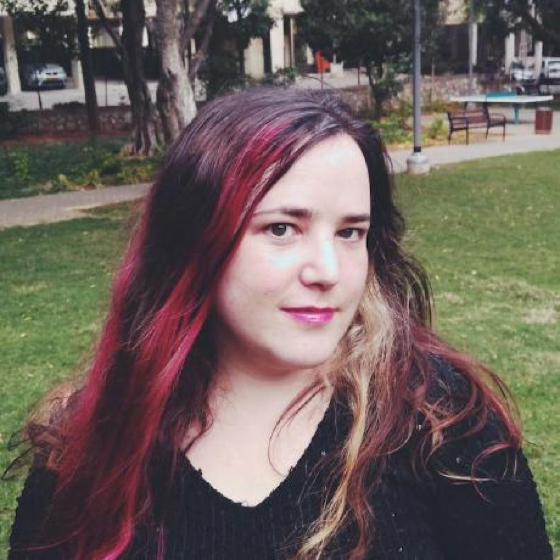 You can read her musings on her Hebrew blog, Anonymous Function, on Medium, and on TheMarker, where she writes a periodic technology column. Hagar has always been a person who has many different interests and creative pursuits. Her interests and hobbies include linguistics, sewing, baking, painting and music.